A real efficiency booster, Lexmark’s new MyMFP feature lets multiple users save and re-access their personal settings on a simple flash drive, including their local address book, personal fax numbers, individual copy settings, and even their own touch-screen configuration. They simply walk up to the MFP, slide in their flash drive and the MFP literally transforms into their own personal device. A warm welcome each time they use it! Before you scan and email an important image file, see how it looks and fits on the page. Should it be in colour or black and white? Is the page orientation correct? Are you sure you scanned the correct side of the page? You may also want to check the file size of the scanned document before you save or forward it on. The Lexmark X658dme lets you preview your scan and note the file size, saving you time and eliminating errors. 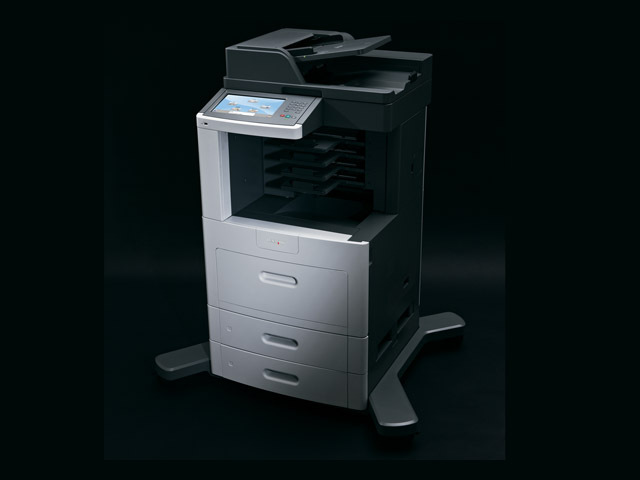 Introducing the intelligent alternative to copiers! The fully equipped Lexmark X658dme multifunctional laser brings you the benefits of a departmental copier, yet in a compact, affordable A4 device. Get everything you need to power through your busy workday, including rapid output speeds, smart workflow capabilities, cutting-edge security and flexible paper handling. 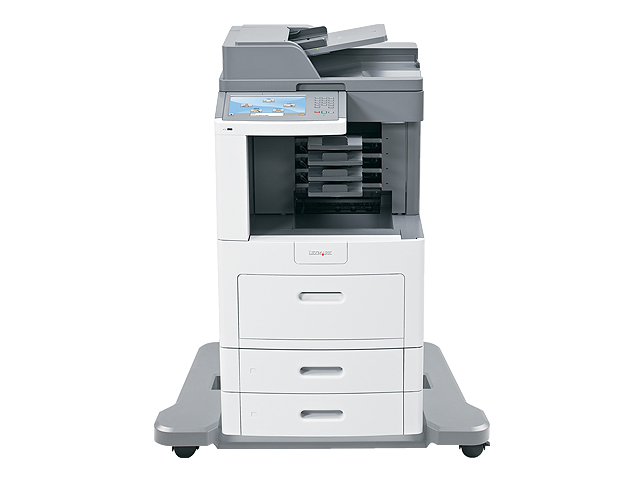 Benefit from a rich range of advanced copy functions to boost your productivity, such as Priority Copy to interrupt long print runs temporarily; ID Card Copy to copy both sides of a card on to a single sheet; Sample Copy to proof the first copy set before printing the remaining copies; and Remote Copy, which you can use to scan colour documents on your monochrome Lexmark X658dme and retrieve them from a Lexmark colour laser printer or MFP. Lexmark's 1-Year Onsite guarantee provides added peace of mind. Enhanced service offerings may be available by contacting your Lexmark representative or visiting www.lexmark.com. Optimize your printer's performance and investment value by using genuine Lexmark supplies, service and parts. When you email a large file from your Lexmark X658dme, it won’t cause a traffic jam on your network. That’s because traffic-shaping technology can partition your network traffic and designate lower bandwidth for outbound flows. This is especially useful for busy networks and externally hosted Web servers. Whether you need to make a large number of copies, scan and send a big presentation, or zip through a high-volume print run, you’re equipped with the robust features and functionality you need to get the job done. With the efficient Lexmark X658dme, it’s easy to save paper, lower the energy your MFP consumes, and use fewer cartridges overall. In addition, you’ll free up valuable office space for other uses and actually print less by reducing the amount of information you print, copy and distribute in hardcopy format. The incredibly large, fully featured colour touch screen gives you fast, easy access to document capture and workflow functions. Tailor it to your business requirements with the icons and shortcuts you need most. You can even change the background image to whatever suits you best, like your logo. When it comes to office performance, there’s very little these MFPs can’t do. You’ll benefit from a wide range of versatile features to maximise your office productivity. Organise your output with the 4-bin mailbox configuration, which lets you assign each bin to a different user or a dedicated function – like one for incoming faxes, one for copies and one for regular output. If you’ve got all these, then you’ve got a Lexmark! Everything you’d expect from a great copier is here, from the robust design to the rapid output speeds. But Lexmark X658de MFPs take over where copiers leave off. Experience more productivity than you could ever imagine! Lexmark’s new MFPs come solutions-ready. That means they can be customised easily to meet your unique printing needs. Contact your Lexmark dealer to find out how simple it is to tailor your MFP with one or more of Lexmark’s leading industry solutions. With the touch of an icon you can transform your hardcopy documents into digital workflow, helping you print less, save time, lower costs, and reduce the environmental impact of printing. Every Lexmark X658dme model arrives pre-assembled and ready to go – you can have it up and running in just a few minutes. If you’re installing multiple Lexmark devices, the Lexmark Universal Driver offers easy deployment. Once you’re up and running, Lexmark’s free remote management software, Lexmark MarkVision™ Professional, keeps the workday flowing. What’s more, Lexmark X658de MFPs are incredibly simple to set up. You can literally roll them into place, and in just minutes you’ll have advanced copying and scanning functionality to dramatically enhance the way you work. The Lexmark X658dme is equipped with state-of-the-art security to protect your valuable corporate data. It also features customisable user-access controls, allowing you to enable or disable functions with ease. By choosing an efficient A4 MFP over a large A3 device, you’ll be able to save valuable office space, lower your total printing costs, boost productivity and deploy time-saving document technology closer to users.